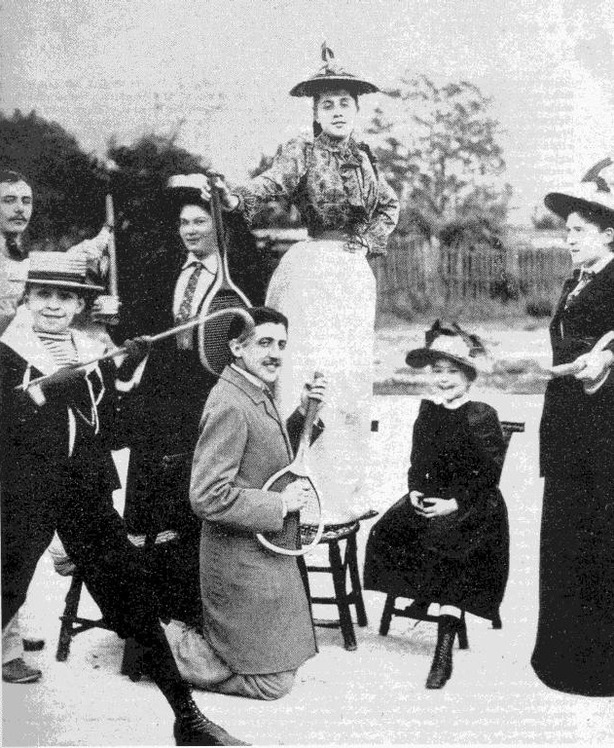 Was "air guitar" a thing back in 1891, when a photographer captured young Marcel Proust in this playful photograph? Probably not. Maybe it's anachronistic to read the photograph this way. But you have to admit, it's worth suspending disbelief for a moment and imagining what song Marcel was playing. Any clever guesses? More like “racket mandolin” I think. PS. A wonderful pic, by the way, thanks. So was Lucia Joyce. Made me wonder if he was an early tennis enthusiast–people have been playing guitar (and mandolin) a lot longer than they’ve been playing tennis. Googled it, and this photo was taken the same year the French Open–not under that name, of course–was first held, and I guess the game was booming in popularity for the first time. It speaks well of a man’s character when he’s willing to plop down on his knees and act silly to make a child smile. Also, he’s got a bit of a Gomez Addams look going on; very appealing. He’s a tough read, though. Tennis can be traced to 12th C. France (in the form of jeu de paume), so while the guitar and mandolin pre-date it by a few millennia, it was hardly a new phenomenon in 1891. Racquets came into use in the 16th C. (Henry VIII was a fan, and Mary Stuart was a regular player). The name “tennis” dates from the 13th C.
The little girl in the chair seems to be enjoying his performance; Proust must have been quite a character.